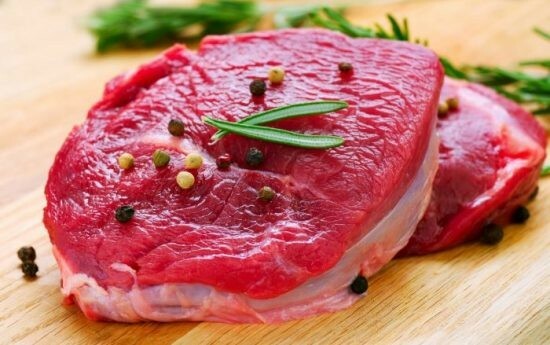 (VOVWORLD) - Beef is the best nutrition source for gymers. It is high in vitamin B6, B12, and iron which is good for building muscle. Beef has rich nutritional value in addition to being a versatile cooking. You can boil, stew, or stir-fry beef. A: Welcome to VOV 24/7’s Food Delight with recipes and food suggestions. We’re…..
B: Hey A, how is it going? B: I mean your workout effort. A: Oh, good. I’m still sticking to my schedule and strict workout menu but it really takes a lot of time. I wish all the excess fat would just disappear without any exercising or going to the gym. B: You’re asking for the moon. If you ladies out there are too busy to eat a healthy diet but still want a slim body, stay tuned to today’s show. Today we’ve invited Nguyen Van Nam, a personal trainer at N’Club Fitness and Yoga Centre to give us some quick beef workout recipes. Nam: Beef is the best nutrition source for gymers. 100 grams of beef contains 28 grams of protein. It is high in vitamin B6, B12, and iron which is good for building muscle. Beef shank is the best choice. A: So beef has rich nutritional value in addition to being a versatile cooking. You can boil, stew, or stir-fry beef. For a workout, what should you have? Nam: I usually have around 200 grams of beef for one meal. The quickest way to do beef is beef sautéed. It does not require many ingredients, just marinate the beef with some seasonings, garlic, black pepper, and olive oil for 5 minutes before you cook. When you cook, heat the skillet, spray a little bit of olive oil, then cook the beef over medium-high heat for 5 to 10 minutes. Remember to turn the beef up side down. Seared beef is quick, easy to make, and preserves the nutritional value of the beef. B: Fantastic. It takes no more than 15 minutes for seared beef. One thing you should remember: it’s better to use vegetable oil, not animal fat otherwise, it will cancel out your workout effort. A: Could you share with us one more recipe to diversify our menu, Nam? This time make it something with vegetables, okay? 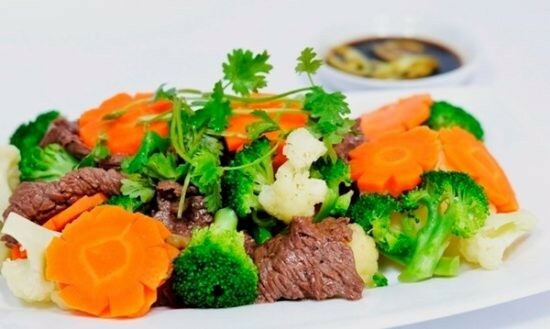 Nam: A second quick recipe is beef stir-fried with broccoli and carrots. The beef is cut into thin slices and is simply marinated with some garlic, olive oil and fish sauce. I prefer the fish sauce. To keep the colors of the vegetables, you should quickly scald the broccoli and carrots in boiling water. For the beef, heat up the oil, stir-fry the beef until it becomes medium-rare, then add the broccoli and carrots. B: You can add one or two celery sticks to enhance the flavor of the dish. Celery should be put in at the end, just before you finish cooking the dish, because celery is easy to overcooked. A: In less than 15 minutes, you have a super-quick and healthy dish with beef. B: Exercising should go hand in hand with the proper diet to assure a healthy body. Thank you, Nam, for joining our show. We hope your workout will be more effective following Nam’s suggestions.